Hosted by Christopher G. and kenneth g.
Business owners, managers, and salespeople learn about each other's business and we share referrals. If this is your first time attending, your breakfast is complimentary! Now, more than ever, business people need to network to stay in business. 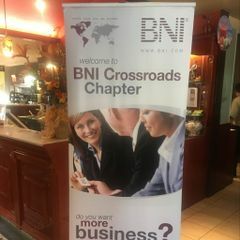 BNI Crossroads provides a positive, supportive, and structured environment to share ideas, contacts, and business referrals. If you or someone you know are looking to increase your sales and your sales force, we have plenty of leads to give out. Check us out and enjoy breakfast while networking. Your first time including breakfast is complimentary. If you choose to come a second time, there will be a $16 admission fee which includes breakfast. Email with questions or for more information.